With my normal level of organisation I said to Julie “it’s either Beyton or Hessett that has a wall painting.” It’s Hessett – but first we parked at Beyton. Village around the Green, now (thankfully) bypassed, then the church set off to the south on higher ground along the Hessett road. 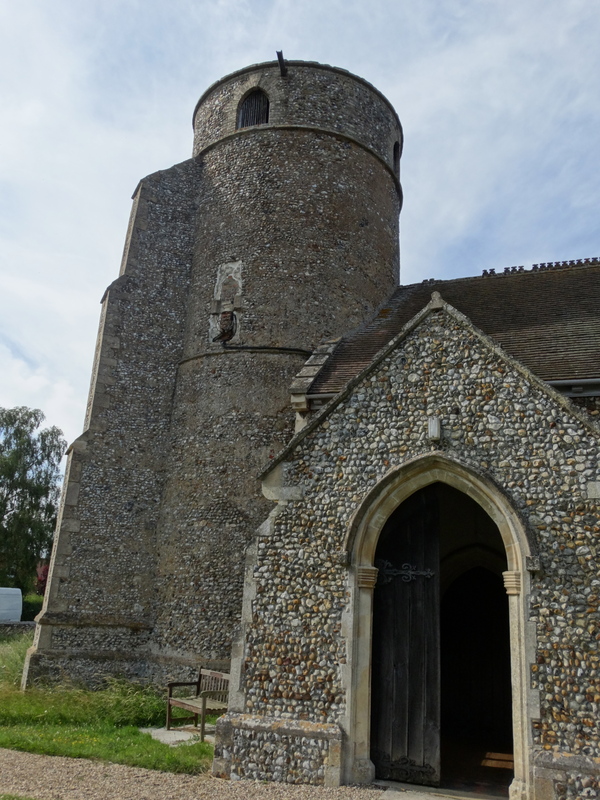 The first thing that strikes you – apart from the fact they can spell “Millennium” (there’s a garage near us which has it wrong on everything) – is this massive round tower. It has a Saxon core, and the buttress was added in the Middle Ages. 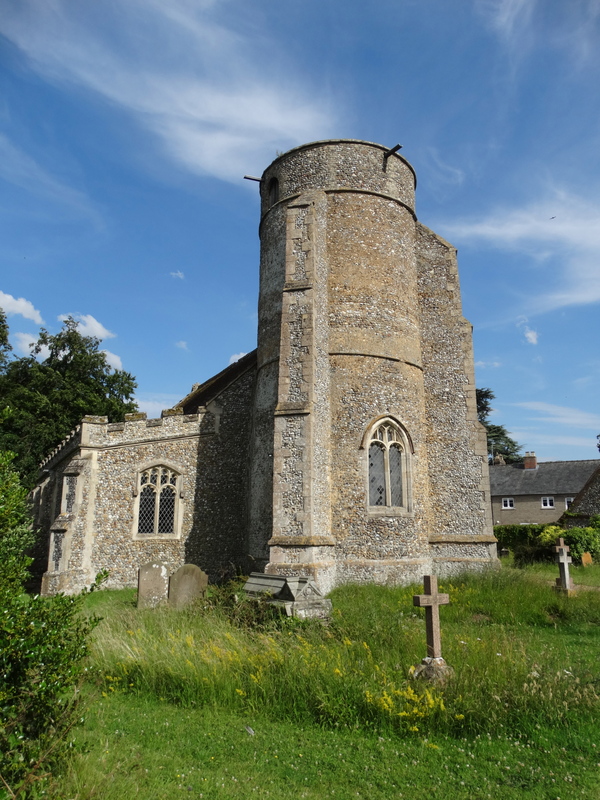 The guide says “Beyton is very proud to be warden of one of the only two buttressed round tower churches in England, the other being at Ramsholt”. 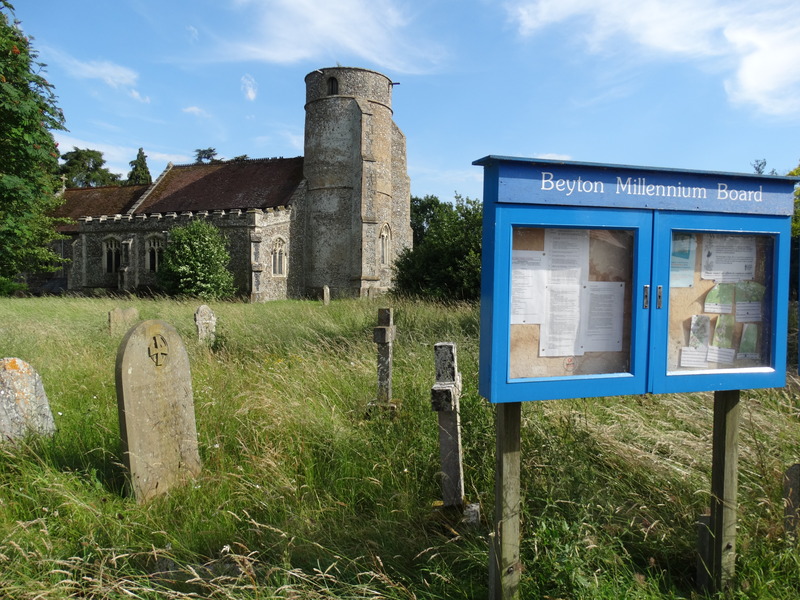 It should really be on the village sign “Welcome to Beyton, proud to be one of only two buttressed …” (no doubt twinned with Pisa). 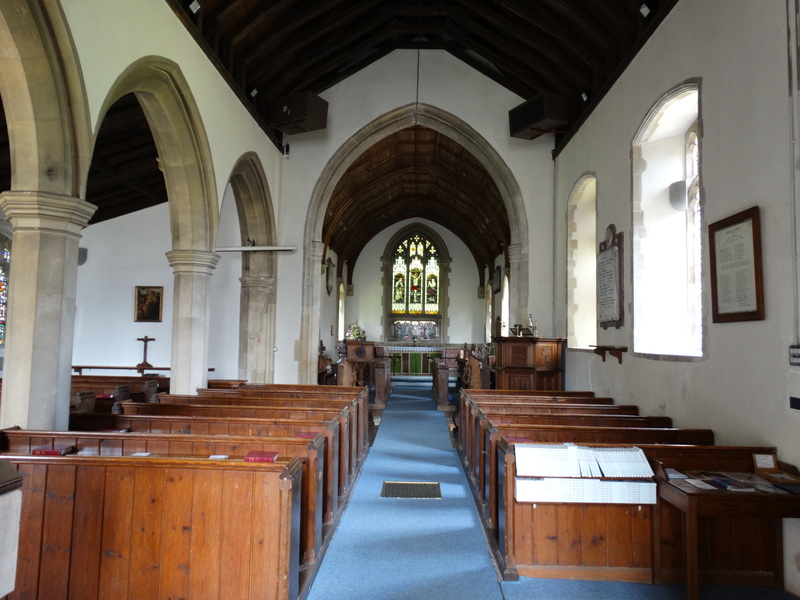 Nice, cared for, interior – and they have made a gentle ramp up into the Chancel which doesn’t look as if it is an afterthought. 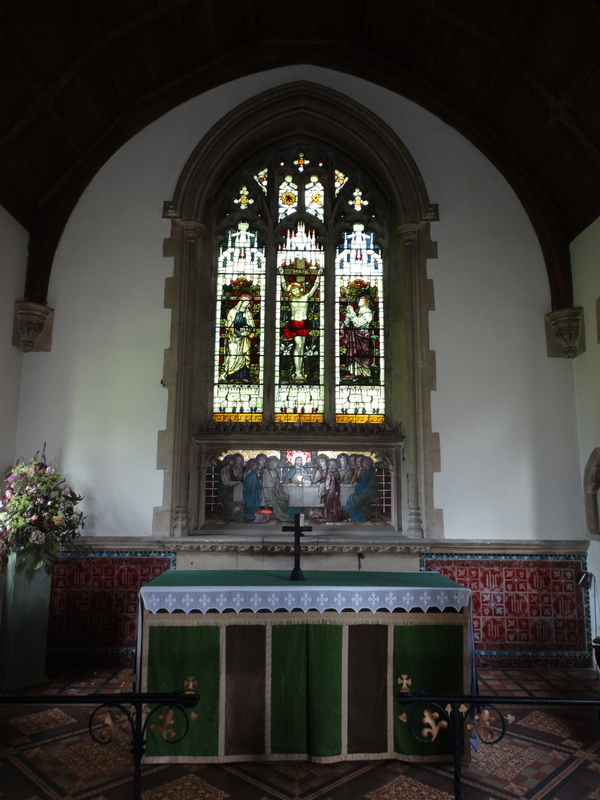 It had three services on the five Sundays in June, being one of a group of four churches. They’ve been a group for 13 years now – the Vicar has been there for 10, and the Ordained Local Minister for longer. It looks as if continuity has helped – the magazine certainly gives a good impression, really well produced, lots going on. The guidebook gives a lovely picture of the village, not just the church building – I like this line: “The records of this parish, commencing from 1540, impress the reader with their quiet continuity and the charitable care of the people by the several rectors who themselves grow old, feeble at writing and then pass from the scene.” You can imagine them standing at this font (C14) and altar (Stuart communion table, C17 – Victorian mosaic reredos). 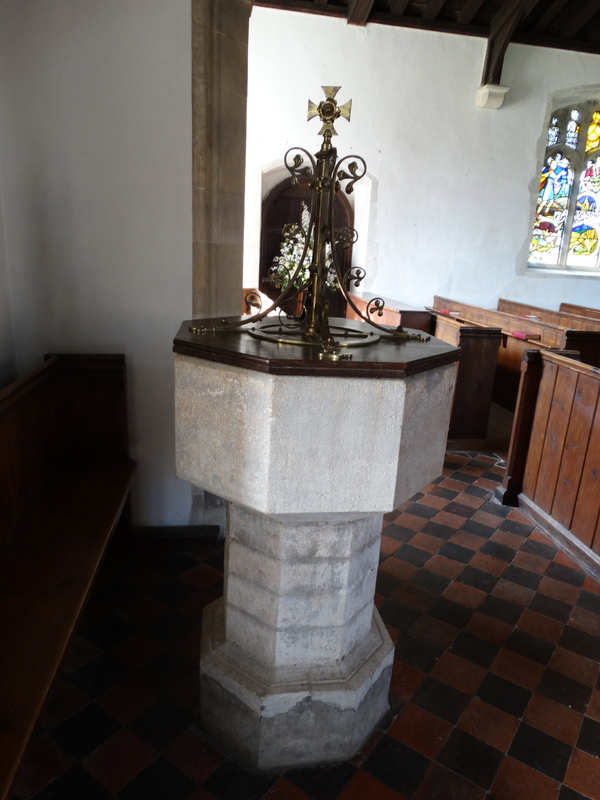 The Chancel was restored in the C14, in the C15 the whole church had a “facelift”, seats were provided in 1480, mediaeval colour swept away at the Reformation, and four out of five bells sold in the late C18 so the church could be repaired (can you imagine getting that sale past the DAC?). In 1834 a West gallery was added and the seats rearranged, there was another rebuild in 1854 – the architect was John Johnson of Bury St Edmunds. 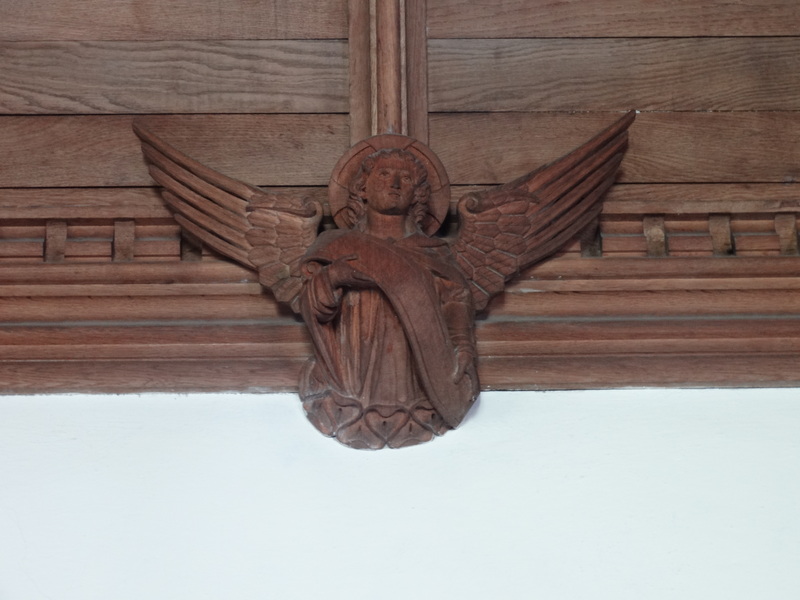 In 1884 the chancel was restored and transformed at the expense of the Reverend Herbert Samuel Hawkins – with this rather nice angel. 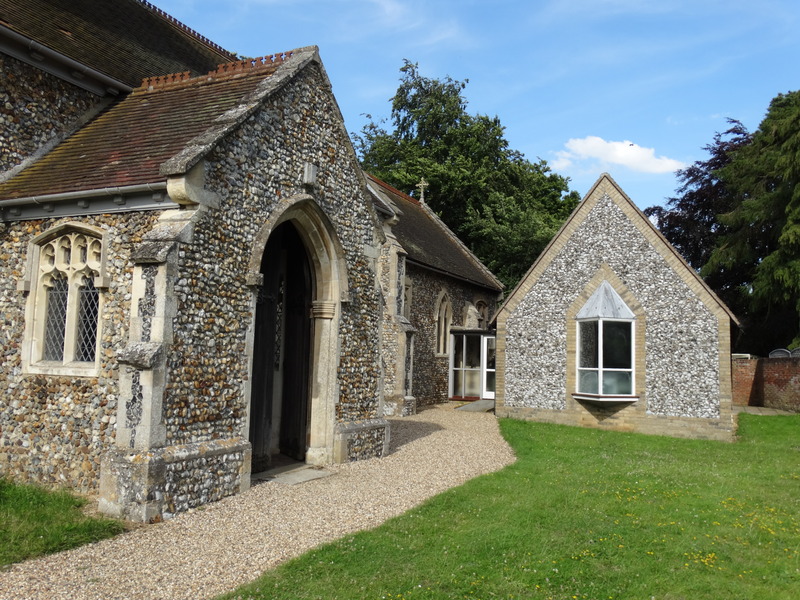 The vestry/hall was added in 1992. 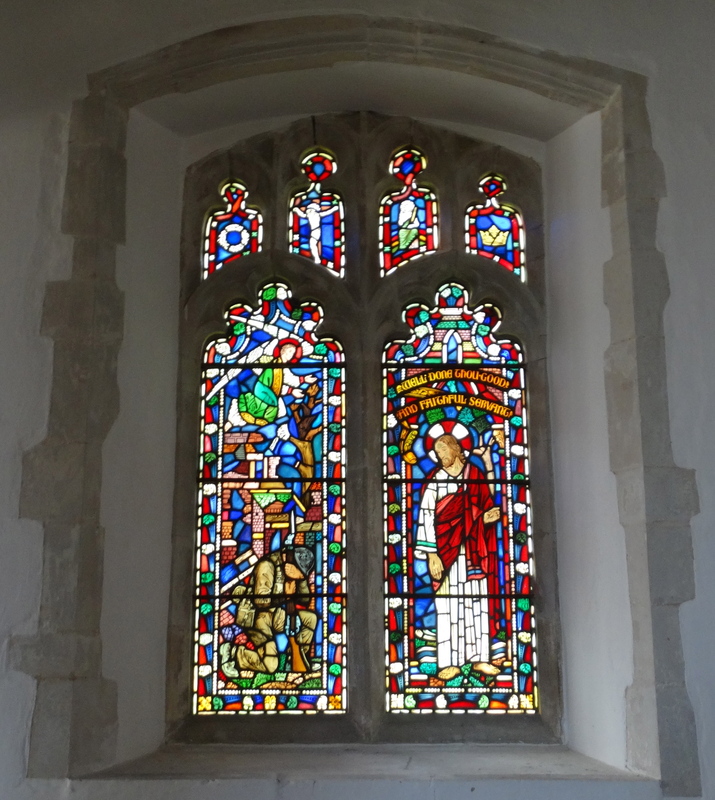 One window is a WW2 memorial – Christ and a soldier – the other is by Goddard and Gibbs, in memory of Frederick Hammond (1919-67). Some of the birds are those to be seen locally. It may not have a wall painting, but it was worth stopping for! 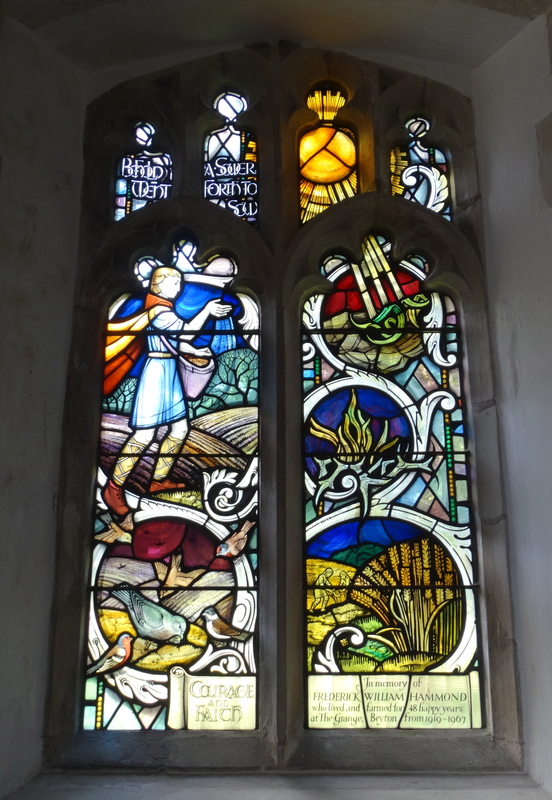 This entry was posted in Outside Northumberland, Suffolk. Bookmark the permalink.